Craving for breakfast taho? When I was still living in Angeles City, I would usually wait for the “taho” vendor at around 9 o’clock in the morning every Saturday. I just love a sweet taho for breakfast. Here in Korea, it’s so easy to make a breakfast taho since tofu can easily be found in groceries. 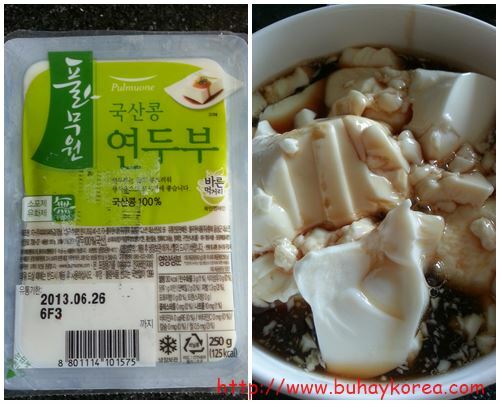 The tofu that I use for my breakfast taho is called ì—°ë‘ë¶€ (yeon-du-bu). It’s texture is silken compared to other varieties. It can also be eaten raw or uncooked. First, I scoop out the yeon-du-bu in a bowl and place it in the microwave oven for 1-2 minutes. To make the sweet syrup, I heat two tablespoons of dark brown sugar with two tablespoons of water until boiling. I just pour the syrup on the tofu and that’s it. No need for tapioca pearls! If I want more syrup, I just double the amount but I’m usually okay with the amount mentioned. Ready to eat in three minutes! Scoop the tofu in a bowl and heat using a microwave for 1-2 minutes. Mix the dark brown sugar and water in a saucepan until boiling. Pour the sugar syrup on the tofu. Hi, ms. betchay, your from angeles city? I was born there and living right now in mabalacat pampanga. I am a third year college student studying in angeles city. One of my dreams is to visit korea and work there when I graduate. Is it possible??? Hi Cams! Yes, I’m from Angeles City. It is possible for you to come and work here, and learning the language would give you an advantage. Hi ms Betchay, Kapampangan din po kau? Hehe. From angeles ku din pu. 🙂 nice to have read some of your posts, very informative. Kutang ku din pu with our plan na 5 dyas stay in Korea, what places would you recommend to visit to maximize our trip po? Frm Seoul advisable pu ba mipunta king Jeju? Mga around how much po ang fare? Thank you.